The thoughts and prayers of the Tulane nation are with Wayne's family. Wayne was a good friend and one of, if not the most passionate Tulane fans in the world. I'll never forget all of our 2-3 hour phone conversations which ranged from Tulane sports to Medieval Central European Knights. Last edited by FW on Sun Mar 09, 2008 6:42 pm, edited 2 times in total. That man bled green and blue. God speed my friend. This is a sad day for all Greenies. Many of you may not know this, but Wayne used to run the original version of what would later become YOGWF. He was one of our most passionate and best supports, and I for one will sorely miss his insight in and enthusiasm for Tulane athletics. I last spoke with Wayne in either early or middle of January, as he told me his condition was not improving. I will miss Wayne and his devotion to Tulane Athletics. I will always remember his calls from P J's and his reverent hollers at Tulane baseball games. Always full of statistical data. I still have all of his numbers in my cell. Good bye old friend.... your going where the Wave never lose. one of the most passionate TUlane fans I have ever met. I remember talking to him at most men's basketball games before his latest illness. Wayne was the original TU recruiting "guru" and has been for 20 years, at least. One night, pre Perry Clark, in a tight game, the player was at the free throw line preparing for the shot. Just as the crowd got completely quiet, the scream of "eat sh... ref" pierced through the slience. The crowd roared. That remains one of the great moments in Fogelman heckling history, complements of Wayne. You bled olive green and blue more than anyone I knew. You have my admiration. Wayne was a character. I first remember him giving the umpires hell, a very personalized hell, at TU baseball games. This was pre-Turchin, when you couldn't tell TU's baseball facilities from those of NORD. This was no shrinking violet. This was no "oh goodness gracious, I'm just proud of our young men's effort" kind of fan. When Wayne Picou went to a Tulane game, he freakin' brought it and if the Wave fell short, he took it personally. He could be pr!ckly, too. This was no plaster saint, but as far as Green Wave fans go, he was (and is, now) an absolute angel. A few years back, we used to ride the bus back home from games. Not together, we just found each other on the bus. It was a great time to talk over what we just saw. I'll never forget one time we were on the bus and we passed a Catholic church. Wayne crossed himself as we passed. It surprised me. Not that he was Catholic, but that he was observant to that extent (I don't even imitate a golf swing when I pass an Episcopalian church ). This is a tragedy. Wayne Picou deserved to see Tulane athletics hit the big-time. He deserved to see what a lot of us local Wave fans pray to see before we die: Tulane athletics free from internal threat, an integral part of the New Orleans community he loved so much, and winning on the level playing field we dream of. Wayne Picou should have lived to see the day we "took action" (to use JtS's words from a post he put up this week) to secure these things. When I think that he won't be here to see this, if it ever takes place, it makes me angry. If it ever does take place, I'll be happy and I'll ask Wayne what he thinks (after I ask my father). If you truly love the Wave, you lost a good friend today. This is truly a sad day. Wayne was Tulane Athletics. You would be hard pressed to find someone more passionate about Tulane sports. I pray he is in peace now. this needs to be made a sticky, JMO. Talking about riding the bus. I'll never forget Wayne riding the bus to Baton Rouge from New Orleans in 2003 for the "meeting" about the review before the Tulane-LSU regional game. Wayne said he would personally beat the #@&* out of me if I didn't attend.....I attended. I didn't know him except thru Tulane insiders. He was great running that site. I can visualize what you all are saying about him. I got to really love reading his reports & "retorts" as well. This just makes me very sad. Last edited by Ray on Sun Mar 09, 2008 9:21 pm, edited 1 time in total. I spoke to Wayne a little over a month ago and he was hopeful for a full recovery. He declined over the last month and through his fighting spirit and prayers, he hung on through some trying medical issues. The Good Lord wanted Wayne to do scouting from a better seat. I saw Wayne last Wednesday and updated him on the Basketball season, the new baseball stadium and a few football tidbits. I believe he knew already. Wayne Picou bled Olive and Blue and promoted our beloved Green Wave as much, if not more than any employee of Tulane since the advent of the Internet. Im still in shock..I still can't believe this....people like Wayne are not supposed to die. His life was TULANE and nothing else. First Attom now Wayne, this is very had to deal with. I think this one of things that's so great about Tulane. Since we do have a relatively small fanbase we are much more like a family than other schools. There should be a moment of silence for him Tuesday night. Although Wayne would probably prefer a moment of screaming at an umpire. This is a very sad day. I'm just stunned. Rest in peace Wayne. For the last 20+ years, Wayne always reminded me of Ignatius Reily - a fact I think he was proud of, when I'd see him at PJ's. His devotion to the program was a very real part of what made Wayne, Wayne. I won't forget him coming up outside the press box at the 'Dome at half time to get a copy of the stats to peruse and think about. I don't think he ever thought we were in a game we couldn't win. I knew Wayne for about 35 years. Although I feel sad, upset and old tonight, I cannot help but chuckle when I think about Wayne's devotion to Tulane and some of his many antics. One (among many) was an idea he had I think in the early 1990's about him establishing a 24 hour Tulane sports radio show. People would call in and speak with him and others about Tulane sports day and night. I laughed and argued with him about the viability of such a project, and then I envisioned him arguing with LSU fans over the air with his own brand of personal green vitriole. If it had happened it would have been hilarious and would have even furthered Waynes legendary status as Tulane's greatest fan. RIP my old friend. doc, when I heard the news you were the first person I thought of. God bless you in this difficult time. I don't know that they ever found out what the ultimate cause of his problems was. Seeing him last night really shocked me. I know he's resting much more comfortably now. Our greatest fan, like many of our great fans, never attended Tulane. I'll share another Wayne story with you all. Wayne and I and others sat behind the basket for years at Tulane basketball games. Well, we always had a hilarious time heckiling refs (especially Paul Galvan) and opposing players. When Louisville and Memphis State came to town (in the Ned Fowler era) Wayne was very serious and there was little levity. When D Moreau hit the famous shot right in front of us to beat Memphis, Wayne was so overcome he turned to me speechless and kissed me before swarming onto the court. Now, how many of you can boast you were kissed by Wayne? What a sad day it is indeed for Tulane. I have not had a chance to see the board since I called FW to tell him the news, but reading through everyone's posts truely shows the number of lives Wayne touched. 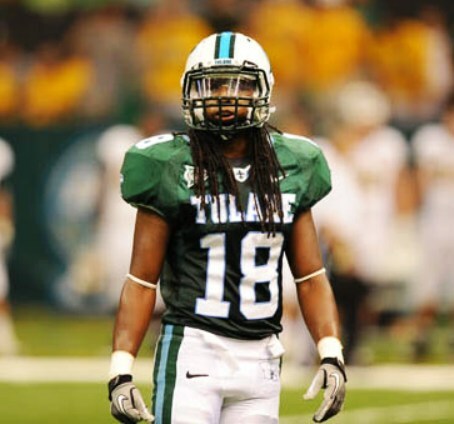 Whether you loved him or hated him one thing you did know about Wayne was that he loved Tulane. Short of Oliver N Blue and his father breaking the news about the review, no one person saved Tulane Athletics in 2003 more than Wayne. For that, we all owe him a debt of gratitude. When I first met Wayne while I was playing tennis at Tulane in the mid/late 90s I honestly didn't believe that there was someone this passionate about Tulane. He was above and beyond a superfan...he was Tulane Athletics. The reason we have an internet presence is because of Wayne. Wayne didn't have the money to build the Wilson Center or the new Turchin, he didn't have the polictical pull to get on the board or anything like that...but he had passion...and a hell of a lot of it. He truley was the epitamy of when you put your mind to it, you can accomplish anything. Our late night meetings, parking lot conversations and all the other "only the movies" type stories during the review proved that. I remember when Wayne called me during Christmas time from the hospital. We talked regularly about Tulane and I knew his health was not good, but I was shocked he was having to go the hospital. It was "nothing much" he told me as he was simply recovering from pnuemonia and would be home soon. For the next month or so we talked almost daily about Tulane and what was going on with recruiting, basketball, etc...i would check his emails for him and he would make phone calls to who he could. The calls became more infrequent as they put him on a breathing machine, but he never wanted to talk about his health, only Tulane. When the calls stoped for 3 days I knew something was wrong. I remember the night of January 23rd when I got an email from Gary Bernard that he had gone to see Wayne and he was not doing well...that is when I first found out he had "coded" or had a heart attack and was in a comma. I had the chance to see him over Mardi Gras when I visited New Orleans and knew we needed a miracle and was praying for one. Last week when I found out he "coded" again and had a 2nd heart attack, it was almost as sad as today because I knew the inevitable was going to happen. Based on GSX's report and others who has seen him since then I know Wayne is in a better place. But Tulane has lost its #1 fan and the void in our lives will never be replaced. I have been approached by different people, many posters or viewers of this board, about organizing an effort to create a memorial on Wayne's behalf for Tulane. Maybe its a scholarship fund...not sure yet, but I will gather information soon and post it. If anyone is interested, please feel free to contact me. Last edited by Donny Z on Mon Mar 10, 2008 12:29 am, edited 1 time in total.